"Mother's love is peace. It need not be acquired, it need not be deserved." As the weather warms up and we can feel summer approaching, it's a good reminder to listen to the body's cues for more hydration and lighter meals. Have you ever tried coconut water directly from a fresh coconut? If you get a "young" coconut it can taste heavenly. Coconut water is full of minerals and nutrients like potassium, magnesium, calcium, and phosphorus which not only hydrate the body but help the muscle function and reduce blood pressure. 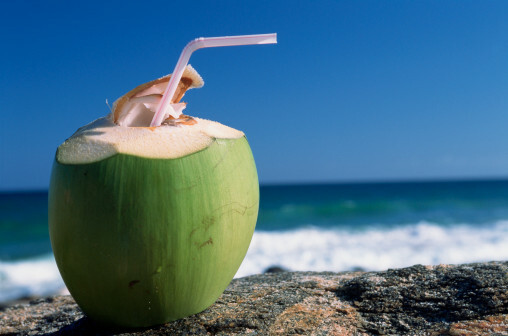 Try out some fresh coconut water and let us know what you think! 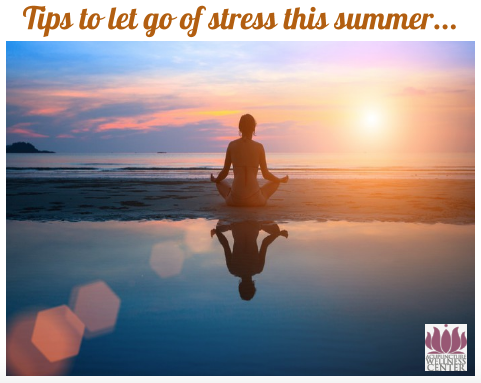 This is a great time to do more outdoor activities so remember to stretch, hydrate and get your balancing acupuncture treatments so you can feel great all summer long. 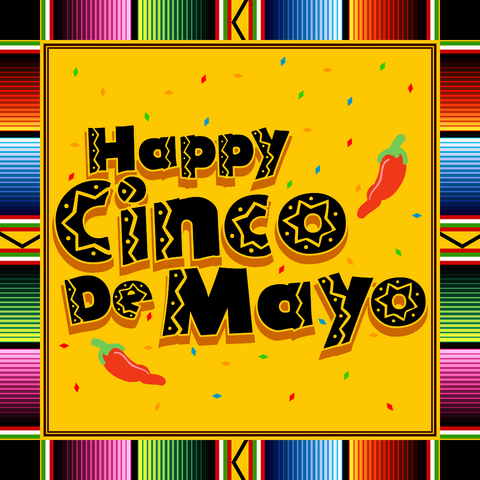 Cinco de Mayo, commemorates the Mexican army's 1862 victory over France at the Battle of Puebla during the Franco-Mexican War (1861-1867). This is relatively minor holiday in Mexico where in the U.S., Cinco de Mayo has evolved into a celebration of Mexican culture, heritage and festivities. 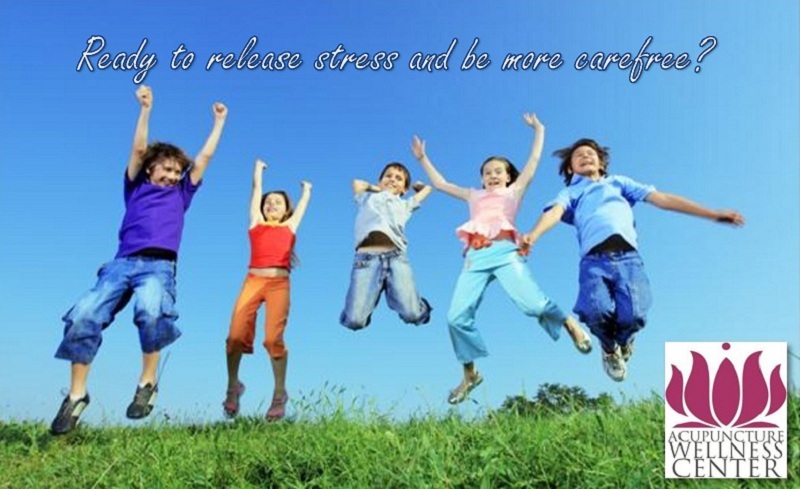 Is it Time to Reduce Stress and Revive Your Vibrant Health? For most of us, understanding that stress has a negative impact on our health and well-being is not a foreign concept. In fact, Ancient Chinese Medicine has been warning mankind of this phenomena for thousands of years. Finally through the new study of Epigenetics, western medical research is now agreeing with what Chinese Medicine has known for millennia, that our genes are not set in stone. In fact, certain stressors (like toxins, emotions, and diet) can switch a part of a person's genome on and off at specific times which affect whether a disease state or other heritable characteristics arise or not. Furthermore, The American Psychological Association's "Stress in America" report provides this table, indicating the effects of stress on your body, your mood, and your behavior. Do you or a loved have any of the stress related symptoms? 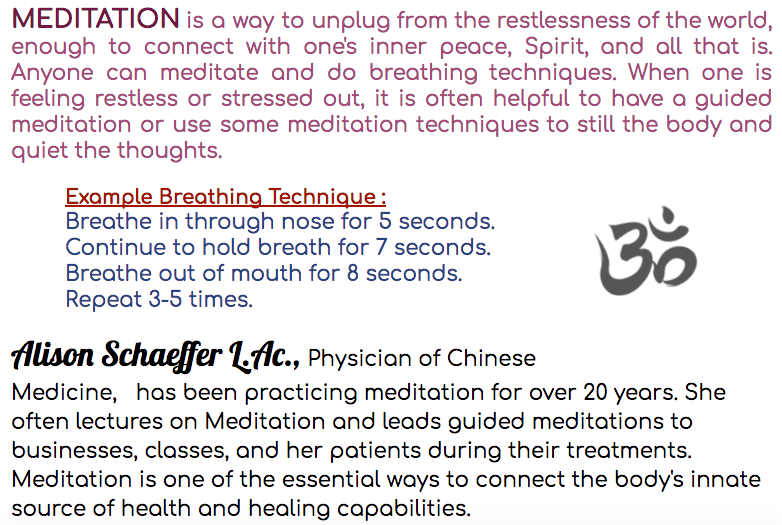 Did you know that here at the Acupuncture Wellness Center, we specialize in treating Stress-Related disorders and teaching Stress reducing, relaxation techniques? 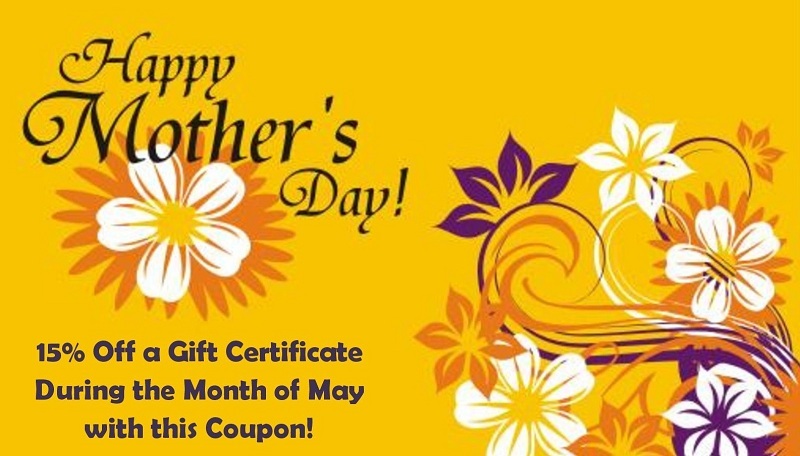 April is Stress Awareness Month, so come in get 15% off a Gift Certificate for a friend who is ready to release the negative effects of stress and RELAX into Vibrant Health and Strength! For those of you who notice that stress affects your stomach come in to find out if the Gastroquell formula is right for you and click here for your 15% off coupon! 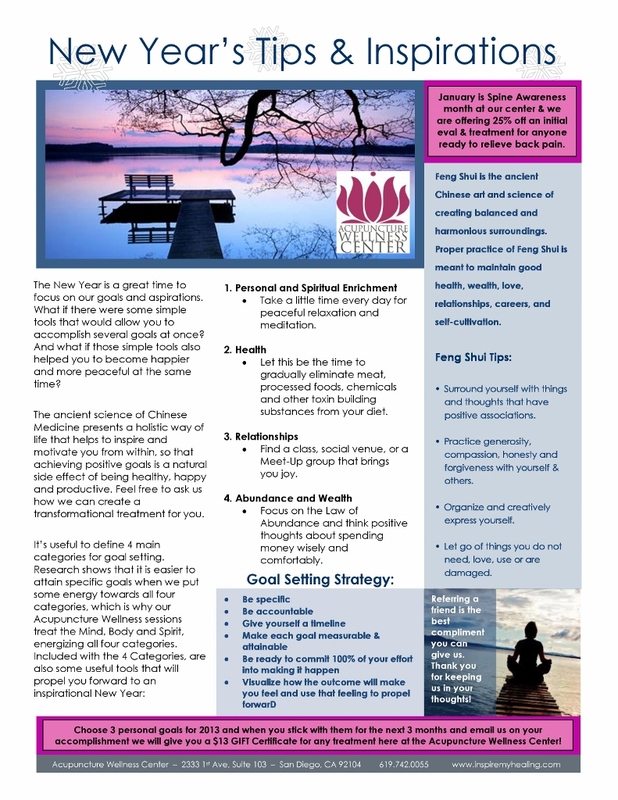 As we presented in last month's newsletter, 2014 is the year of the Wood Horse for the Chinese Lunar Calendar. The Wood Horse is also called the green horse because green is the color that represents the wood element in Chinese Medicine. Spring is a special season for the Year of the Wood horse as wood is the element associated with spring. This Year Spring Equinox begins on March 20th. What foods are best to eat in spring to keep the body healthy and in tune with the seasons? One of the easiest ways to stay healthy in any season is to eat fresh seasonal foods. A good guideline about what to eat during any season is to build your meals from what is available at your local farmer's market. Some examples of spring vegetables are asparagus, corn, green beans, peas, peppers, artichokes, fava beans, spinach, kale, rhubarb, bok choy, purple sprouting broccoli and calabrese broccoli, wild garlic, green onions, lettuce, morels, wild mushrooms, shitake mushrooms, peas, spring onions, cabbage, beets and carrots. As the weather warms up, have some spring fruits such as cherries, bananas, berries, figs, kiwis, mangoes, pineapple, nectarines, peaches, plums, or apricots for a balancing snack. Gently warming pungent foods are particularly good for spring. These include fennel, oregano, rosemary, caraway, dill, bay leaf, grains, legumes and seeds. Pungent flavored foods stimulate circulation of Qi and blood. Pungents also regulate Qi, enhance digestion, disperse mucus, stimulate the lungs, blood and heart, guard against mucus forming conditions such as common cold, remove obstructions and improve sluggish liver function. Foods that are pungent improve digestion and decrease gas and bloating. Add pungent herbs such as mint, spring onions, ginger, horseradish, chamomile, and black pepper to meals with grains, legumes, nuts and seeds to make them less mucus forming. Also, remember to cook your legumes and grains with a little salt to make them easier to digest. Honey and mint tea is perfect for spring because it encourages Qi circulation. Mung beans, green peas, and green beans are advantageous during spring and help to clear heat that can build up and lead to congestion. Seaweeds, algae, spirulina and chlorella are vital during Spring. We use and recommend the supplement Vitamineral Green. Aside from being packed full of life-giving nutrients, they will help detoxify the body and heal the liver, allowing the regenerating energy of Spring to flow in your body and promote health and wellbeing . Omega 3- fatty acids, found in flax seeds, coconut oil and wild fish oils are also very important in the spring time. They will help improve mood and energy and promote healthy hormone production. In addition, they are anti-inflammatory and nourish tendons and joints, which is important during Spring. The Chinese New Year Celebrations for the Year of the Wood Horse started on Friday, January 31st and continue on for at least 10 days. The Horse is the seventh sign of the Chinese Zodiac, and represents high spirits, optimism, energy and beauty. This sign is known for being graceful and majestic, as well as being full of energy and power. Last year was hard on most of the 12 signs of the zodiac and this year will be brighter. Some years, some houses catch a break and others catch the brunt of difficult energies. Not in 2013. This past year, the difficulty was spread around to everyone. Moving forward into the year of the wood horse brings opportunity for success and change throughout 2014. In Chinese culture, the Horse is a symbol of nobility, speed and perseverance. People born in the Year of the Horse are independent, hard-working, and fabulous speakers who have a gift for connecting with others. People bearing the horse sign strive towards seeking freedom, and are cheerful, talented and down to earth. In general, 2014 will be an especially good year for those people who were born under the Year of the Horse and an excellent year for all the houses! I enjoy utilizing this time of year for introspection and to review and renew my goals and resolutions! 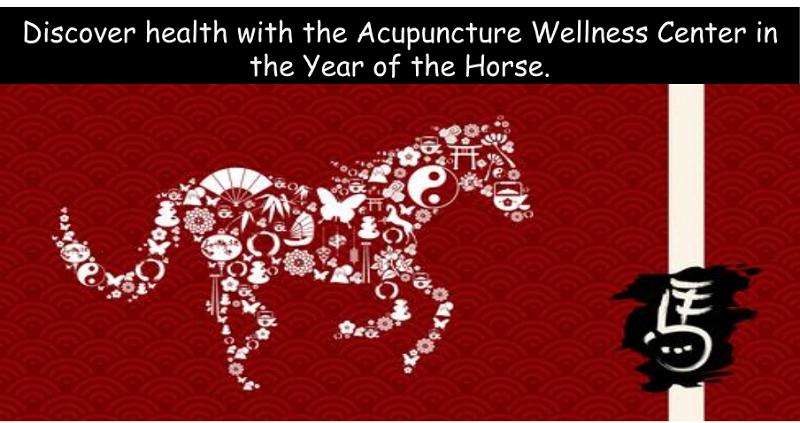 Let us assist you with a rejuvenating wellness treatment that enable you to gallop into the Year of the Horse with renewed energy and vitality! May you face the upcoming year with the grace and confidence that embodies the spirit of the Horse! As we move into the fall season, we notice that the air is crisp and clean and you can see for miles with the clear visibility. The characteristically cool and dry weather of the this season is conducive to a good night's sleep. According to Chinese Medicine, it is best go to bed earlier and rise earlier in order to be in harmony with the natural dictates of the season. We see in Nature that most creatures retreat inward to consolidate energy. We too can use this season to retreat inward and structure some time for reading nourishing material, drinking warm tea (ie: ginger, cinnamon, fennel, licorice, cardamom are all good for Fall), Meditating longer and doing exercises that stretch and nourish the joints like Yoga, Tai chi, and Qi Gong. According to Oriental medicine, the season of autumn is associated with the element of Metal, which governs organization, order, communication, the mind, setting limits, and protecting boundaries.The lung and large intestine are the internal organs related to Fall and the Metal element. Metal is associated with the emotion of 'letting go of the old and bringing in the new.' According Feng Shui, the ancient art of placement, Fall is a good time to clear clutter and let go of older items that we aren't using in order to make room for the new. It's a great time to start an organizational project like cleaning out a closet or junk drawer. Chakra Acupuncture is also effective in clearing out old beliefs systems and habits that are no longer useful to us. Take our Space Clearing Quiz located near the bottom of this page! The lungs control the circulation of the Wei-Qi, which is the defensive Qi that protects you from the invasion of flu and colds. A weakness in the lungs can lead to a weakness in the Wei-Qi, making a person more prone to frequent colds. Ask us how to reserve your bottle of Cold Quell Herbal Formula. Autumn is a time when our bodies and minds are making the adjustment from the abundant sun and brilliance of Summer, to the more cold and sparce experience of Winter. There is nothing like a crisp clear Autumn night. However, there is a natural sadness that many people experience with the loss of sunlight, as the days fall away and the night time lengthens. And the lungs are the organ most affected by sadness and grief. Medical science refers to this psychological illness as Seasonal Affective Disorder, S.A.D. One of the strengths of Ayurveda and Chinese medicine, is an awareness of the effects the seasons have on our immune systems and how we are connected to them. Schedule an appointment to determine how the change of seasons has affected your emotions and learn more about the three kinds of Qi that strengthen the immune system. This year the Spring Equinox will arrive on March, 20th. According to Chinese Medicine, the Spring season is a wonderful time for deeply detoxifying and cleansing the body of harmful impurities that have collected in our organs and tissues. Spring is related to the wood element and to the liver and gall bladder. Hence, the liver is the focus of the spring cleanse. As we detoxify the liver, however, it is also important to support other parts of the body - especially those involved in secretion and detoxification. The liver is the main focus of our Spring detox and you can ask us or click here to read about our Intestinal and Liver Detox Kits, Packages, and Specials. The liver and gall bladder govern the emotions of unresolved anger, frustration, and irritability. In addition to cleanses, acupuncture and energy medicine can release emotional stress stored in the body. This Spring can be a wonderful time for regeneration and renewal of the mind body and spirit. In the Spring, it is important to engage the body in movement, stretching and outdoor activities. Yoga, Qi Gong, Acupuncture and Meditation, are all excellent ways to align with the renewing and unobstructed energy of spring. These profound balancing techniques can allow us to experience relief from congestive emotions and support the health of the liver and the rest of the body. 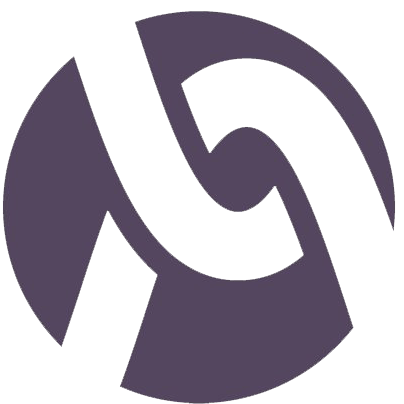 In addition to your Acupuncture treatments, it is our goal to give you tools that you can utilize throughout your day to re-balance and relax. Click here to watch Alison demonstrate three Acu-Yoga poses that have been shown to help strengthen the back and relieve tension! It's time to feel like a kid again! We have hidden three colorful egg pictures throughout our website. Locate them and email us the three word phrase that you find written on them for $10 off your next treatment and all participants get entered to win a free Cold Laser Treatment. Dear Friends, Feb 10th, starts the year of the Chinese Water Snake. It's a year of transformation bringing in the Yin or Nourishing component. The Water Element symbolizes wisdom, empathy and peacemaking. The nature of water is persistent which allows it to find its way around obstacles and challenges. The Snake is transformative in its capacity for spiritual healing of the individual, as well as the community. It is a good time to save money to prepare for the future. The Water Snake nurtures growth and expansion and helps us to be more introspective. The Snake encourages shake-ups in old realities that open the way for forward thinking, refreshed understanding and growth. As the Snake sheds its skin, we are invited to release old beliefs that have blocked progress or no longer serve us. Feelings become more acute and senses are heightened. The Snake offers the opportunity to 'see' more, notice more, and exercise perceptive abilities to enhance our decision-making. Happy New Year and feel free to use this opportunity to refresh your goals and will power to create a fabulous 2013! 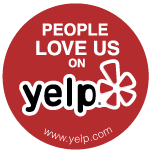 We'd love to support you on your path to feeling uplifted in mind, body and spirit. Use this coupon to recieve 20% off Immune-Plex - an ancient formulation of powerful healing mushrooms and supplements to increase energy and the immune system. Also, for our amazing Wellness Special click here! You may like to utilize the momentum of the Chinese New Year to do some clearing and Feng shui of your home or office. Feel free to take our complimentary Space Clearing Test below to motivate you to a more peaceful, organized, and Feng Shui space. By the way, we've been working hard making some video content for our website and now you can watch a Testimonial clip - starring patients like you!